Class 2MT 46464 has again been in the news. The Arbroath Herald of Friday, 28th May, carried an illustrated article on the closure to all traffic of the Carmyllie Light Railway. This little engine—unnamed—but endowed with a number of symmetry unparalleled in its class has had its moments; the last passenger working on the Arbroath and Forfar, double heading (chimney to chimney) with its sister 46463 on the memorable RCTS/SLS Special up the Carmyllie branch, other workings for enthusiast Societies and active participation in the Gordon Highlander, Morayshire festivity at Arbroath. For fourteen years the Carmyllie pilot 46464 has had no life of ease. 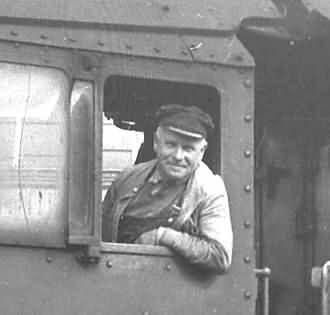 At times whipped into service on the passenger trains to Forfar, to Tayport, or on the joint line it has of late been treble-manned, much of its activity being concerned with the agricultural industry of the neighbourhood. Potatoes, sugar beet and raspberries varied by a strange admixture of the tang of tar (Dowrie siding) and sea breezes. The Carmyllie Light Railway became officially closed to all traffic on Monday, 24th May, but passenger services ceased 30th November, 1929. On Wednesday, 19th May, 46464 worked the last train, consisting of a van, open wagon and brake for the purpose of collecting and bringing down to Elliott Junction what remained of the furnishings and effects. A lovely summer morning with a dry rail and nothing of a train. Up for the last time through the sylvan beauty of Kelly Den, over the cattle guards at Arbirlot and first stop Cuthlie to load recoverable material. Cuthlie to the last had provided a considerable volume of the agricultural traffic. Then the long drag at 1 in 40 and 1 in 36 to Denhead and on to the tableland of 500ft. from sea-level to 500ft. in five miles! The arrival of the last train at Carmyllie evoked no public interest. It was only too evident that the flourishing agricultural community is managing very well without the railway. Higher still and on the sky-line could be seen the derelict remains of the extensive quarries that over a lengthy period produced building and paving stone for notable works in many parts of the world and provided the raison d'etre for the railway. What a marvellous procession of engines must have passed this way over the years! Not only the quaint NB 0-4-0 tender engines, the immaculate Caledonian 0-4-2, the NB Drummond 4-4-0 Ts, the Drummond and Mclntosh C.R. 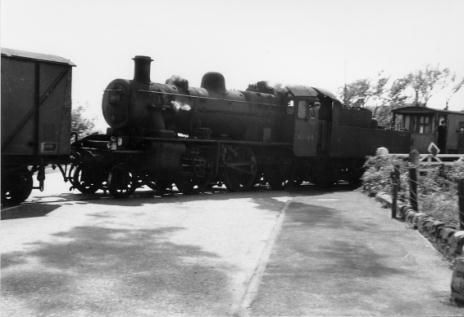 0-4-4Ts, the latter in L.M.S. crimson lake and the stalwart J24s of North Eastern origin, but also a curious medley of industrial types for work on the quarry extensions of which remains only a vague and tantalising memory. And so with a guilty sense of “Is your journey really necessary” 46464 and her freight slipped silently away, unregarded and without even a whistle. By the late Ian N. Fraser .